Walmart on Tuesday announced that starting next month it will roll out the mobile upgrades to create a “faster, easier, and more convenient experience” experience for pharmacy and money service customers. 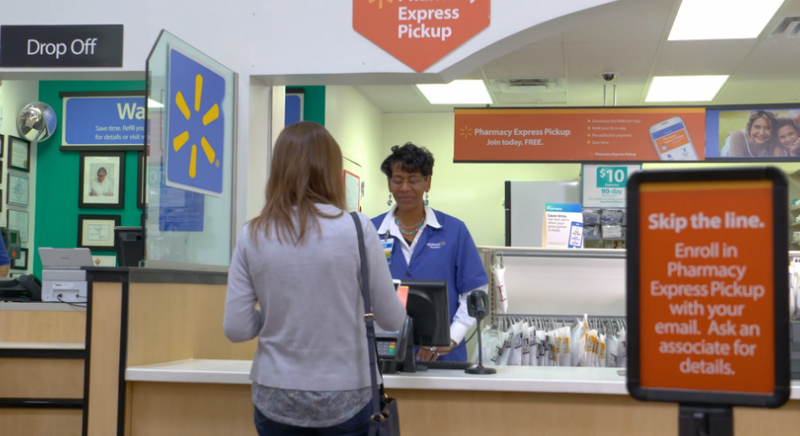 With the update, Walmart pharmacy customers will be able to refill prescriptions from their phones and use an “express lane” to pick up their order and pay electronically. To get started with the online pharmacy services, Walmart says customers can input some information — such as scanning prescription numbers — into the app prior to coming into the store. To complete the transaction, customers must come to the pharmacy counter, open their app and tap “prescription ready for pickup,” enter a PIN on their phone, scan a code displayed on the register, and then pick up their order in the department’s express lane. A nearly identical paperless transaction will also debut in the retailer’s money services department, that allows customers to transfer money in stores each month. Instead of filling out paperwork for money transfers, under the upgrade, customers will be able to enter data on their phones, go through the money services express lane, and scan a register code to verify the transaction and pay. A receipt and reference number is then sent to the app and can be emailed or texted from the phone, Walmart says. In stores that don’t have a Money Services desk, customers can visit the Customer Service desk to complete the same process. The new features are expected to be available at all of Walmart’s stores by the fall.